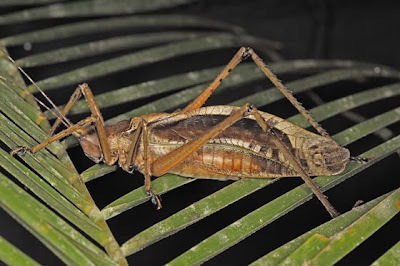 A couple of weeks ago James Walker called to say he had found a male and female of the Queensland Palm Katydid, Segestidea queenslandica Rentz, Su & Ueshima on his property in the Redlynch Valley, Cairns. This is a large katydid, with females measuring 9 cm in body length (that's some 3.5 inches for our northern readers). This katydid is pretty common in rainforest habitats from Cooktown to Cairns and over to the Atherton Tablelands. It is an obligate palm feeder. It seems to feed on a number of species, including the many introduced palms grown by rainforest residents. It prefers Lawyer or Wait-A-While palms (Calamus spp.). This katydid has an odd biology, (Rentz et al. 2006). The species is known from dozens of females, but only one male prior to James' discovery was ever seen. Unmated females lay eggs that hatch into more females. This in itself seems unusual. It is not unknown in katydids. 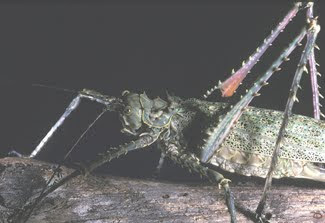 Spiny katydids of the genus Phricta occur in habitats similar to the Palm Katydid but they are not palm feeders. The consume other plant material. Males seem fairly common in this genus but unmated females will lay eggs that hatch--into more females. These two genera are in different subfamilies, so this trait has evolved separately in two unrelated genus groups. Male Spiny Katydid, Phricta spinosa (Redtenbacher). 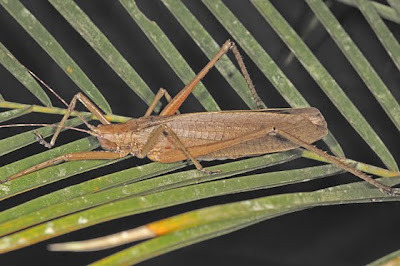 The male of the Queensland Palm Katydid looks very different from the female. It's more robust and a little shorter in length. The tegmen (fore wing) shape is considerably different with the subcostal region greatly expanded. This may be related to the observation that the male produces and extraordinarily loud call. James reckon it can be heard 20-30 metres through the rainforest. This is quite incredible when compared to other katydids. The Phricta noted above produces a very low "zwick" sound that can be heard only a few metres distant at best. In fact, the collector of the first male, Craig Wilson, heard the male katydid from a moving vehicle and found the singing male without much searching. Female Queensland Palm Katydids oviposit (lay their eggs) in the ground. So that means they must make their way down to earth from the heights of their habitat high in the palms. This they do during the night and they can often be found in gardens after dark low on shrubbery or on the ground. The eggs hatch sometime later towards the end of the dry season. The nymphs (juveniles) must then discover the appropriate food source. This is inevitably the young leaves of lawyer palms. Nymphs are light-coloured, almost white. In this respect they resemble , to our eyes, bird droppings or bits of fruit on the palm leaves. As they mature, they gradually ascend the palms and eventually reach the desired habitat where they reside for several months. Rentz, DCF, Su, YN & Ueshima, N. 2006. Studies in Australian Tettigoniidae: The Mecopodine Katydids Part 2 (Orthoptera: Tettigoniidae; Mecopodinae; Sexavaini) Queensland Palm Katydid. Transactions of the American Entomological Society, 132: 229-241.